A Southern woman’s hair is the crown she never takes off; and any lady worth her salt doesn’t settle for a dull, lackluster crown. That’s why when our mane is starting to feel dowdy or drab, we know it’s time to freshen things up with some highlights. Brown hair with blonde highlights lets you have the best of both worlds with its rich foundation of brown and sun-kissed touches of blonde. Not to mention, possibilities are endless when selecting the perfect blonde highlights with brown hair blend that matches your tone and personality. Cool ashy browns call for icy and beige blondes, and warm chestnut browns yearn for buttery and honey blondes. Master the blonde-brown look by going with the rich tortoiseshell blend of chocolate, chestnut, caramel, and honey; or, if you think blondes have more fun, aim for the envious cream soda blend of beige browns with warm gold. Whatever you’re looking for—or don’t know you need yet!—can be found in these gorgeous brown hair with blonde highlights ideas. We’ve got the options: short and long, light and dark, traditional highlights and balayage, and everything in between. Get ready to slide one of these looks over to the hair stylist during your next appointment. This look injects some life into dark chocolate brown locks using thin, very subtle blonde highlights. The touches of blonde catch light in a way flat brown hair can’t. Short hair doesn’t mean boring! And this cool-toned brown bob got some cool-toned blonde to match, making it a perfect sandy color. Nothing revives some dark brown ringlets like some golden blonde highlights. 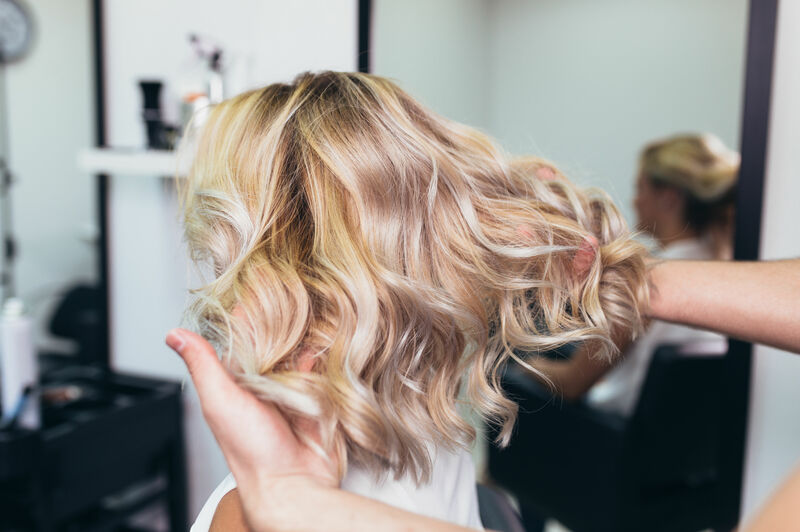 Curls are often approached with a free-hand technique, such as balayage, to give dimension without completely transforming your hair color. This light brown lob gets an icy touch with platinum blonde highlighting that looks uniform and full coverage. These highlights look good on those who might be natural brunettes, but definitely think blondes have more fun! The cool blue-gray tones in this ashy brown hair look even more eye-catching with fine icy blonde highlights throughout the layers. If we found a better ashy head of hair, we’d be surprised! This dark hair is almost black, making it easy to go bold and striking with caramel blonde balayage around the face and towards the ends. Rose gold is on trend right now, from makeup to hair color. These subtle rose gold highlights add a great deal of personality to this mahogany long bob. We never thought such a pretty waterfall of color was possible before setting our eyes on this wavy mane. Starting with a medium cool brown and ending with the perfect golden butter blonde achieves a flawless look. Tortoiseshell hair—the blend of chocolate brown, chestnut, caramel, and honey—is one of the hottest hair color trends this year. Adding a little extra honey blonde in the look makes for a fun spring and summer style! We love a crop with long side-swept bangs, and this style has the perfect balance of light brown base that’s amplified with highlights and lowlights. This mahogany-toned brown hair gets a little boost from face-framing golden highlights that match the warm tones of the hair. Face framing is the way to go if you don’t like to be rigid with touch-up appointments and are only after a pop of brightness. Adding super thin platinum highlights gives a subtle, yet intense touch of dimension to dark chocolate brown hair. Tread lightly, as highlights this much lighter than the base color can go too far if done too heavily! Ashy brown means that your locks lean towards cool tones, such as blue, rather than warm tones, such as red and gold, like chestnut browns do. This ashy light brown works with these cool honey highlights to create a cohesively cool style. The sun-kissed lower half of this hairstyle makes it look silky smooth and buttery soft. The butterscotch tone of the blonde works with the warmer brown shade perfectly. This most thoughtful style uses very determined touches of lighter blonde to really play up the dark chocolate brown color of this perfect lob-length cut. Where does the brown start and blonde end? That’s the point! This perfectly blended, stylish stacked bob is our answer for defining the term: bronde. The sweet-as-sugar look of caramel-tinted honey blonde highlights is enough to make us book an appointment at our salon right now. The richness of this dark mocha brown provides the perfect base. We feel like we’ve always underestimated the cool factor behind these cool ashy tones, making us feel a little late to the party. This extremely dark ashy brown shade can only be complemented with cool blondes, like this icy shade. Jazz up a super sassy pixie with some golden flecks! This adorable short haircut is nothing if not full of style. It’s hard to go wrong with sandy brown hair, unless you’re leaving it flat in color. Inject some personality into the beige tone with blonde highlights that match the neutrality of the sandiness. This ashy dark brown mane makes a statement with heavy platinum ombré, with ends almost completely blonde and roots completely dark. This style will grow out flatteringly, making touch-ups not as frequent! We can’t imagine a better pairing than this sweet cola brown and buttery honey blonde. They come together for the perfect cream soda finish. If you have very neutral medium brown hair, then these honey-beige highlights are the way to stick with your tone and lighten things up for spring and summer. The balayage is done with a heavy hand, resulting in chunkier honey-beige highlights. This cinnamon brown hair benefits from some copper and blonde highlighting, especially around the face and on those layers. This tone really makes green, hazel, or brown eyes pop. This cohesive look captures the perfect blend by going only a shade or two lighter than the light brown color and perfectly painting highlights that mix into the base color. This ashy dark-as-coal brown makes us hesitant to recommend super blonde highlights, but these heavily face-framing touches of golden blonde work out just fine! This heavier balayage starts closer to the dark brown roots, making quite the cherry cola statement. This style is perfect for the lady who loves a little pop of red! The goal of this look is to make everything mold together seamlessly for a rich finished color. This pure chocolate brown is matched with a neutral beige blonde for a unified palette. This tousled mane of hair makes the most of its natural thickness by placing perfect golden highlights starting at the crown and working down in artful balayage strokes.